Making the transition from cruise flight to the beginning of an instrument approach procedure sometimes requires arriving at a given waypoint at an assigned altitude. When this requirement is prescribed by a published arrival procedure or issued by ATC, it is called a crossing restriction. Even when ATC allows a descent at the pilot’s discretion, you need to choose a waypoint and altitude for positioning convenient to start the approach. In either case, descending from a cruising altitude to a given waypoint and altitude requires both planning and precise flying. Figure 3-27 illustrates the basic descent planning task. The task begins with an aircraft flying at an assigned cruising altitude. The aircraft must descend to an assigned altitude and reach that assigned altitude at a designated bottom-ofdescent point. The next step is to choose a descent rate and a descent speed. The ultimate goal is to calculate a top-ofdescent point, which is the point at which, if you begin the descent and maintain the planned descent rate and airspeed, you will reach the assigned altitude at the designated bottom-of- descent point. The simplest technique for calculating the distance required to descend uses a descent ratio. 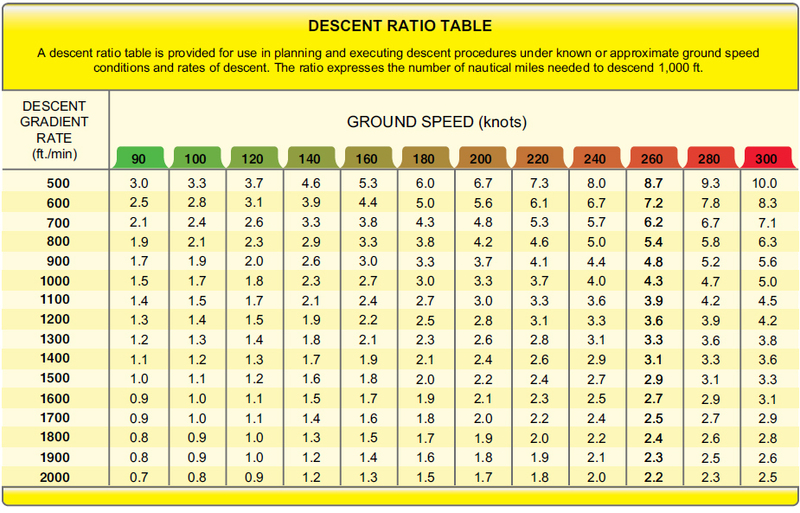 The table in Figure 3-28 lists a descent ratio for many combinations of planned descent speeds and descent rates. Calculating a descent is a simple matter of looking up the descent ratio for your target descent rate and groundspeed, and multiplying the descent ratio by the number of thousands of feet in altitude that you must descend. For example, suppose you are asked to descend from 11,000 feet to meet a crossing restriction at 3,000 feet. Since there is a 200-knot speed restriction while approaching the destination airport, you choose a descent speed of 190 knots and a descent rate of 1,000 feet per minute (fpm). Assuming a 10-knot headwind component, groundspeed in the descent is 180 knots. Referring to the table in Figure 3-28, the planned descent speed and rate indicate a ratio of 3.0. This means that you will need 3 NM for every 1,000 feet of descent. You must descend a total of 8,000 feet (11,000 feet – 3,000 feet). A total of 24 NM is needed to descend 8,000 feet (3 NM × 8 = 24 NM), and must, therefore, begin the descent 24 NM away from the end-of-descent point. Another technique for calculating descents is to use the formula shown in Figure 3-29. A descent table can be found in the front of each set of U.S. Terminal Procedures on page D-1. Working through the formula for the ECA VOR crossing restriction example, 8 minutes is needed to descend 8,000 feet at the planned descent rate of 1,000 fpm. At your planned descent speed of 180 knots, you will cover 3 NM per minute. Thus, in 8 minutes, you will cover 24 NM. Once again, you must start the descent 24 NM prior to ECA to meet the crossing restriction. Regardless of which method is used, it is always a good idea to locate the top-of-descent point chosen on the aeronautical chart. Figure 3-30 shows a chart that covers the area surrounding the ECA VOR. A top-of-descent point 24 NM prior to ECA is located 3 NM before PATYY intersection. Figure 3-30. Top-of-descent point on an en route chart. Using the aeronautical chart to locate the top-of-descent point has a second advantage. 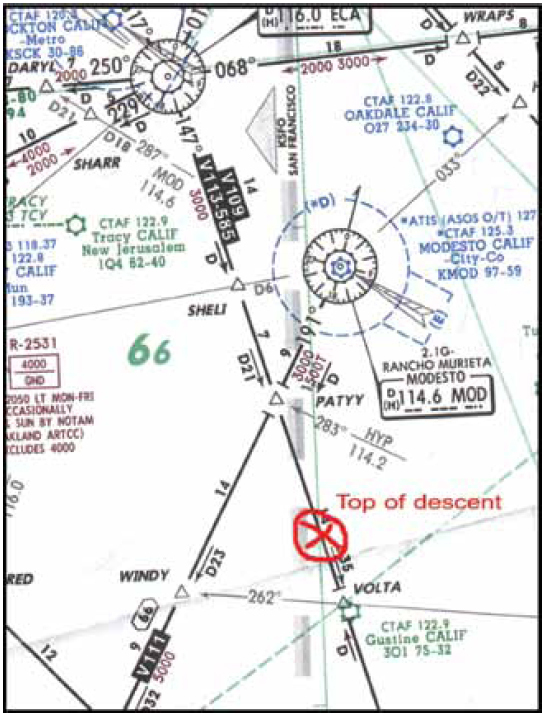 Since regulations require you to have an alternate means of navigation onboard if the computer does not comply with TSO 146B, the aeronautical chart allows you to check minimum altitudes for VOR reception along the route of flight in case VOR navigation is required at any time. The airway that leads to the ECA VOR lists a minimum en route altitude (MEA) of 3,000 feet, which is the clearance altitude. Building a descent with an FMS follows the familiar process of entering the basics of the descent into the system, letting the system do the math, and then reviewing what the system has produced. Most FMS units offer a descent planning or vertical navigation (VNAV) page that allows you to enter the details of your descent. Figure 3-31 shows the VNAV page for one manufacturer’s system. Note that there is an entry for each of the descent planning concepts discussed above. Computers perform the calculations using the same formulas and data. Figure 3-31. Planning a descent with an advanced avionics unit. It is a good idea to cross-check the results of your manual descent calculations with the results produced by the computer. 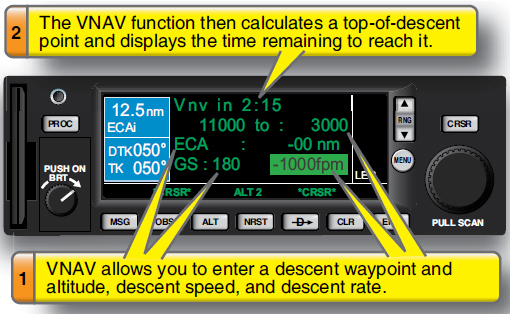 Many RNAV units do not display a waypoint for the planned top-of-descent point. However, there may be an “approaching VNAV profile” message that anticipates the descent point and cues the pilot to begin descending. Caution is advised that some systems calculate the vertical flight path dependent on the current airspeed/groundspeed values. Lowering the nose and gaining airspeed in the descent may confuse you into perceiving a false vertical goal or vertical rate, resulting in failure to meet the crossing restriction with some systems. Determine if the system recomputes the airspeed/groundspeed, or if you must enter the descent airspeed during the VNAV programming.